Thursday On March 27,* a bill will be heard that would effectively grant a blank check to Xcel Energy for spending on its two nuclear facilities, the Prairie Island and Monticello power plants — plus guaranteed profits for Xcel shareholders. The bill (HF 3708 / SF 3504) bypasses the cost controls and checks on spending that exist to protect consumers of monopoly, for-profit utility companies. Under the current law, a utility must consider what investments are needed based on how much electricity is needed to supply Xcel customers, and compare the costs of nuclear power to other available options. Additionally, the Public Utilities Commission (PUC) reviews the utility’s spending to ensure that it was prudent. Alarmingly, this bill would allow nuclear costs to be considered in isolation, with no standard by which the PUC might disapprove proposed investment, and no check on how ratepayers’ money was spent. Nuclear investments run in the billions of dollars. Xcel recently told the Star Tribune that they expect to spend a minimum of $1.4 billion more on these plants — but their last nuclear upgrade ran over budget by more than double. That high level of spending makes cost controls and consumer protections even more important. This bill protects utility shareholders — allowing the company to collect profits on whatever level of spending it says is appropriate — at the expense of captive ratepayers. CUB, AARP Minnesota, the Energy CENTS Coalition, and the Minnesota Citizens Federation Northeast sent this letter to lawmakers on March 21 and issued this joint statement on the bill last week. Please call. Contact Governor Dayton (651-201-3400) and the members of the Senate Energy and Utilities committee and ask them to not move forward with this bill. Attend the hearing. The hearing is open to the public, and I hope you will attend. The bill will be heard in the Senate Energy and Utilities Finance and Policy Committee on Thursday, March 22 at 1:00 p.m. in Room 1150 of the Minnesota Senate Building (95 University Ave. W., St. Paul). Speak at the hearing. Anyone may request to speak. You do not need to be a utility expert; it is valuable for members of the public to tell Senators how they view the bill and how it could affect them. If you would like to speak, contact Committee Administrator Darrin Lee at 651-293-2962 or darrin.lee@senate.mn. If you contact policy makers and/or request to testify, please let me know (annielf@cubminnesota.org). As always, I’m happy to try to answer any questions you might have. Thank you, and please watch CUB’s Twitter and Facebook pages for the latest updates from the legislature. * Hearing date updated after the initial hearing was cancelled. 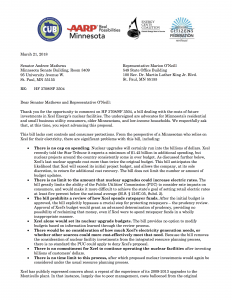 4 Responses to "Bill would grant blank check to Xcel for nuclear spending, profits"
Despite the Amended language bringing some improvements, does CUB have any statement or analysis that says SF 3504 is still fundamentally a blank check that gives Xcel preapproval for cost recovery on their nuclear plant projects? Regardless, every message in the March 21st letter still stands because the language of its House Companion bill 3708 remains unchanged. Is there any clue as to when or if HF 3708 will have a committee hearing? Even after the amendments made in the Senate energy committee, the issues raised in our letter still remain. The bill still provides for an advance determination of prudency, preventing the PUC from reviewing how ratepayers’ money has been spent. While the initial consideration of the nuclear plant would happen within Xcel’s integrated resource plan, which would allow for a comparison to other electricity options and make sure that customers are getting the most cost-effective option, there is still a process to bring “additional proposals” for nuclear plant spending, presumably outside of that process. There is no standard that the PUC could use to evaluate those additional proposals, and it creates a moving target that would make it difficult if not impossible to judge if those investments would be cost effective. There is also an option for Xcel to withdraw its proposal for nuclear plant investments at the end of an integrated resource planning process, if the company doesn’t like the modifications that were made through that process. I’m not sure how that would work, as at that point the nuclear plant would be an integral part of the overall plan. No hearing has been announced on the House companion yet. This week is legislative break, so the soonest a hearing could happen would be next week. Thanks Annie, Interestingly enough, here is something else that strengthens your case. In an August 27th, 2014 Star Tribune article Xcel’s regional Vice President admitted that nuclear plant projects across the country have virtually without exception required substantially more cost than initially anticipated. So if that is true of virtually all nuclear plant projects, then how can it possibly be consistent or wise to legislatively enable Xcel to determine rate-payer cost effectiveness based on their initial estimates? To unpack that question, does “advance determination of prudency” mean the PUC being asked to rubber stamp an upcoming Prairie Island Project proposal as “prudent/ cost effective for ratepayers” based only on the initial project cost estimate number that Xcel gives? That initial amount Xcel gives to the commission would almost certainly be a lowball cost estimate using the logic of their own quote. When you wrote “preventing the PUC from reviewing how ratepayers’ money has been spent” it would mean that the PUC can’t go back and revisit an initial determination of prudency even if they learned about the project having huge cost overruns like we saw in Monticello? If the answer to both of those questions are yes, then the company’s top spokespeople are contradicting themselves to defend their stances both before and after the fact and counting on decision makers to not notice or not care. If this bill passes, I am guessing the only real point of intervention the PUC would have is to reject an Xcel Prairie Island project proposal on the presumption that huge cost overruns are inevitable. But given what you wrote in the middle paragraph of your reply, would the hands of this quasi-judicial body be too tied even to do that? I think you’ve put your finger on it, Lee. At its core, this bill transfers risk of cost overruns from the company and its shareholders to customers. The bill is written in anticipation of costs above the initial budgets for nuclear plant investments. It is the “additional proposals” language that would allow Xcel to increase its spending beyond the original budget amount. Regarding the advance determination of prudency: The usual process is that the PUC approves a project at a certain budget, the utility does the project, then comes back to the PUC in its next request for a rate increase with an accounting of the funds that were spent and how. The PUC will says “yes, that was prudent spending,” and allow the utility to charge those costs to customers. If prudency is pre-determined, then anything Xcel were to spend up to the approved budget would be automatically charged to customers; the PUC couldn’t check to make sure customers money wasn’t spent in inappropriate ways or that costs weren’t too high due to poor management. If the bill were to pass in its current Senate form, the PUC would have the ability to set the initial budget. However, Xcel would have a final say over whether or not to accept the PUC’s budget changes, and could come back to update the budget an unlimited amount. I think it’s very unclear what would be the ability of the PUC to oversee those updates.